Recurrent Exertional Rhabdomyolysis (RER) refers to a type of muscle disease that occurs in sport horses, that is actually a subset of recurring "tying-up" episodes. 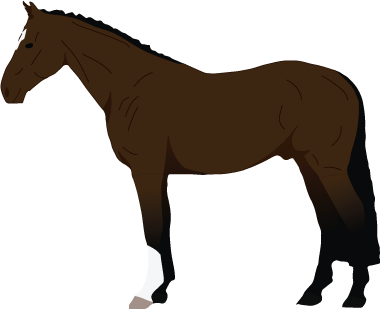 It is a clinical syndrome which occurs when horses exercise, resulting in painful muscle contractions and necrosis of the skeletal muscle fibers. RER occurs most commonly in young, skittish female Thoroughbred horses, especially racehorses. It is also seen in Arabians, Warmbloods, and Standardbreds. According to the University of Minnesota's Equine Genetics and Genomics Laboratory, 5-10% of all Thoroughbred racehorses suffer from RER during the racing season. Horses with RER have a history of repeated signs of muscle stiffness during exercise. Episodes most frequently manifest once horses have achieved a certain level of fitness, when asked to hold back during a race, following a steeplechase race, or at the beginning of the last portion of the three-day-event, which is the cross-country phase of eventing. RER is believed to be caused by an abnormality in intracellular calcium regulation that occasionally acts up while the horse is exercising. A genetic susceptibility to RER has been shown to exist as well, where affected horses pass the trait to 50% or more of their offspring. Do not move the horse until your vet arrives. Diet management Modify diet to include less concentrated feed and more quality hay. Switch to a low sugar/ low starch feed. If needed, provide supplmental fat for increase of carbohydrate intake. Exercise management Ensure regular, consistent exercise without any days off and daily turnout. Diet - Feed horses a low sugar, low starch (NSC) grain with plenty of high quality hay. If needed, such as for performance horses, extra energy can be obtained by fat supplementation, in order to increase their carbohydrate intake. Activity level - Ensure horses have daily turnout and consistent exercise. Genetics: Thoroughbred, Standardbred and Arabian horse breeds.